If you’re like me a favorite fall pastime is going to one of our local apple orchards to pick apples and stock up on other fall produce like pumpkins and squash. Once you return home are you at a loss for new, creative and delicious ways to use your bounty? Join us monthly for Fit and Flavorful where our Chef will demo healthy and delicious recipes. For October our featured recipes were Apple Dumpling and a Butternut Squash and Apple salad. Speaking of recipes are you someone who becomes lost in a recipe with the various culinary terms you see listed…stir-frying, poaching, pan searing, Oh my!!! If you’re looking to learn more on these and other culinary skills look no further than Creative Techniques. Each month we offer classes that will highlight a various cooking skill and break down the basics steps needed. This month our Chef will teach you all about roasting and use of spices to flavor your foods. Since we’re on the topic of culinary skills did you know we offer a hands on knife skills class? This class is designed to teach you how to properly and effectively use a chef’s knife to help save time in the kitchen! Who wouldn’t love less time cooking and more time enjoying your meal with family and friends? Another unique culinary offering we have this month is I am the Chef started October 6. 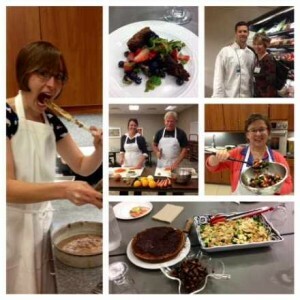 This is a 6 week participation cooking class where you work right alongside the Chef and dietitian to prepare tasty and nutritious meals that are enjoyed together at the end of each class. A past participant, Steve had this to say, “It was a great way to discover foods I wouldn’t have used in the past.” So please join us to discover new foods and skills. Perhaps you have the perfect recipe on hand but struggle with all the pre-planning and grocery shopping that accompanies meal prep. Join us for our 6 week menu planning class. The DAHLC dietitians will lead you through the skills and steps you will need to effectively plan and stock your kitchen to help save meal prep time during your ever busy week. Lastly, we offer Nutrition and Fitness classes. This class is geared towards all you dedicated exercisers out there who are working hard in the gym but perhaps not seeing the results you want. The DAHLC dietitians will help you take a look at your nutrition to see if that is the missing link in your wellness journey. That is just a taste of all the culinary/nutrition offerings this month at the DAHLC. Remember to always look for new and upcoming classes on our website or in the Newsletter and Source. We look forward to seeing you in the future in one of our classes.